After The Dark Knight made $1 billion worldwide, Warner Bros. allowed director Christopher Nolan to make his passion project, Inception—though most passion projects don’t get a budget of $160 million. The confusing-but-exhilarating film made more than $800 million worldwide. Here are 22 things you might not know about the film. 1. Nolan wrote Inception in addition to directing it. He actually came up with the idea in the early 2000s after he finished making Insomnia. Originally, he considered using the same concept, but as a horror film. 2. Nolan was influenced by the creative processes that he knew—so there are quite a few metaphors for filmmaking. 3. Nolan didn’t research dreams while writing the screenplay. 4. To get the studio on board, Nolan had to convince them that the various dream layers would be as minimally confusing as possible. 5. The casting decisions revolved around DiCaprio. 6. In addition to affecting the cast, DiCaprio also altered the script. 7. Page didn’t have to audition at all. She met with Nolan for a sit down that had nothing to do with the film. The next week, she was asked to read the script for Inception. She had to read it in an office, not at home. Luckily, she loved the character and Nolan gave her the role. 8. Ariadne is named after the daughter of Minos in Greek mythology. 9. The movie was filmed around the world. The rotating set that Arthur flies through was created in Bedfordshire, England. Calgary, Alberta was the location for the epic mountain scenes. They also did shoots in Morocco, Tokyo, London, and Los Angeles. Overall, they ended up filming in six different countries. 10. They considered filming in 3D. Eventually, though, Nolan determined that they would be “too restricted by the technology.” After filming, they almost converted the movie to 3D in post-production, but there simply wasn’t enough time. 11. Nolan wanted most of the explosions to look surreal, rather than the standard Hollywood orange flames. Shooting guidelines in Paris frowned upon the use of actual explosions. So, the crew used high-pressure nitrogen, which they set off right near the cast. Said special effects coordinator Chris Corbould, “When we let an explosion off behind an actor, you get a very different reaction from when he is standing in front of a green screen and someone yells, ‘Explosion!’” More debris was added and the explosions were enhanced in post-production. 12. The paradoxical stairs were inspired by the art of M.C. Escher. 13. Nolan's team built sets that shifted and rotated. For the scenes in which Arthur is floating around the hotel without gravity, Gordon-Levitt wasn’t acting in front of a green screen or placed in zero-gravity. The crew actually built the set so it could rotate a full 360 degrees. Then, they would suspend Gordon-Levitt from a wire to get their shots. It took 500 people and three weeks to film all those scenes. Gordon-Levitt only used his stunt double for one shot. 14. The actors didn’t have too much trouble telling which level of the dream world they were supposed to be in at the time. 15. The mountain set was built into the side of a mountain. The set, built into a mountainside in Alberta, had no snow at the time. In fact, the crew was starting to get concerned that they wouldn’t end up having any snow by the time the shoot started. “The art department kept sending us pictures of mud," Thomas said. "The week before we went up there, we still had no snow.” But that wasn’t a problem for long. They ended up shooting in the middle of blizzards after the biggest storm of the decade. 16. The scene in which the van falls off the bridge in slow motion took months to shoot. According to Dileep Rao, who played the driver Yusuf, “We’d shoot it one day, go off and shoot something else. Then shoot another piece of [the van]. It was so complex and there were so many locations and so many different moves I have to do. It’s the stuff that makes or breaks that last sequence.” For the underwater portions, actors were holding their breath for up to five minutes at a time, with the occasional top off from a SCUBA tank. As for how they got the van to fall off the bridge? It was shot out of a cannon. 17. Though Nolan handled many special effects on set, there was still a lot of work to be done in post-production. For instance, Franklin said, “Getting the bits and bobs to fall out of the hotel cleaning trolley [in zero gravity]? That’s one guy — months of lonesome work.” And a team of CGI specialists worked on the “Limbo City” scenes with DiCaprio and Page for nine full months. 18. The song used to cue the characters into waking up is “Non, je ne regrette rien” by Edith Piaf. The song resembles the film’s score, which is no coincidence: Composer Hans Zimmer actually went to the National Archives in France, found the original master for the song, and extracted one beat that he then heavily modified. 19. Nolan finished both early and under budget. He actually prefers the constraints that time and money give him, so he makes a serious effort to be efficient when it comes to filmmaking. 20. 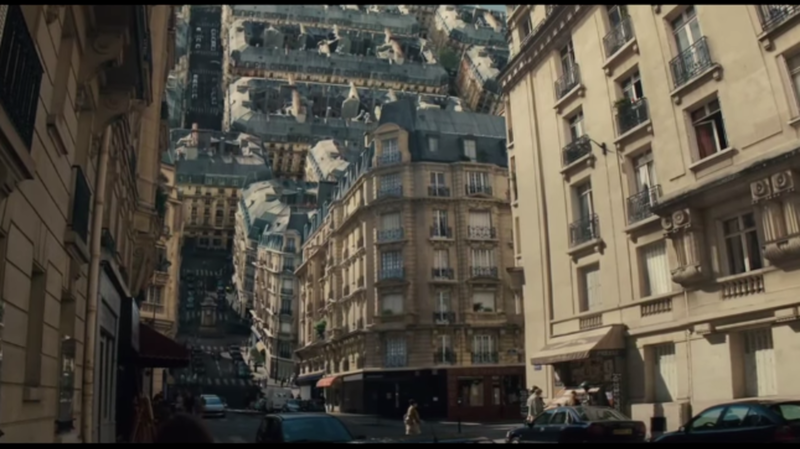 Nolan hasn’t commented much on Inception's ambiguous ending. In 2010, he told CNN that the film was intentionally left that way, so he has no desire to add to the conversation. “There can’t be anything in the film that tells you one way or another because then the ambiguity at the end of the film would just be a mistake," he said. "It would represent a failure of the film to communicate something. But it’s not a mistake. I put that cut there at the end, imposing an ambiguity from outside the film. That always felt the right ending to me." 21. Film scholars have tons of different theories about the film. Some of these include: it was all a dream, Saito is the actual architect, and Cobb is dreaming/not dreaming/dead at the end of the film.